Now there's more than one "Sparty" statue on the campus of Michigan State University. There's the statue that sits on the banks of the red cedar, and now there's a bronze version of the Sparty mascot at the MSU Union Building. Alison Brown created the 6 foot tall, 7 foot wide, 15 hundred pound statue. It sits on a bench, and fans are able to sit next to it and have their picture taken. Brown, in her 20's, is the owner of "Campus Sculptures." "One of the things that's been so wonderful about this project, is that MSU has involved its students in this in every step of the way. Students were involved in the selection process of the sculptor, in deciding which pose the Sparty statue would take, etc. I think it's wonderful how the university has involved its students so thoroughly in this way," said Brown. It was unveiled Wednesday as part of the homecoming week celebrations. 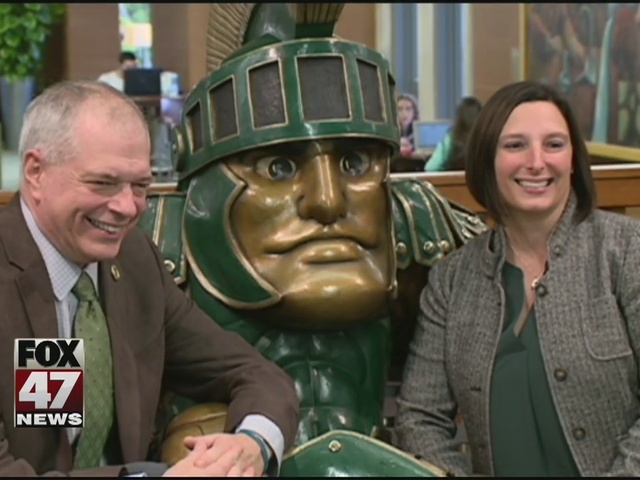 "The MSU union is really excited to be the home of this bronze tribute to America's favorite mascot, all biased aside," says Tami Kuhn, Director of MSU union. "And, we wanted it to be unveiled during Homecoming Week."